The Boy King, King Pacal (603 - 683 AD) followed his mother as ruler of Palenque (located in modern day Chiapas Mexico) and ascended to the throne at the age of 12. In addition to her talk about King Pacal and his son Chan-Bahlum, Dr. Robertson will talk about Palenque and the early 19th century explorers of Palenque such as Teobert Maler and Alfred Maudsley. Dr. Robertson has worked at Palenque for the past almost 30 years. During their "Cross Group Project, Palenque" they made major discoveries in 1998. She leaves Saturday, March 6, for Palenque where she is directing the Palenque "Group of the Cross Project" with Principal Investigator Alfonso Morales. She will be back in time to get her photographs of the new things they are finding for the March 26th Meeting where she will be telling about it. They have probably the largest "dig" in Mesoamerica this year and are doing some state-of-the-art investigating of this Maya site. 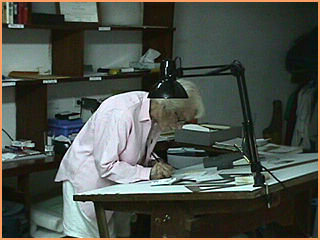 Click to visit Merle Robertson's Web page on Rubbings of Maya Sculpture. 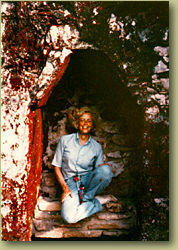 In 1996, Dr. Robertson carried Explorers Club Flag #152 while recording new discoveries at Chichen Itza, Yucatan, Mexico. The Mexican government awarded her the Aztec Eagle, the highest award bestowed on a non-national. She has authored over 60 scientific articles and 14 books, the most important being the 4-volume set, The Sculpture of Palenque, published by Princeton Press. Click to visit La Colecci-n de Relieves Mayas Calcados La Colecci-n de Relieves Mayas Calcados en Papel Merle Green Robertson, cuya adquisici-n comenz- en 1969, contiene m‡s de 2,000 calcas hechas sobre papel de arroz, fabricado a mano en Jap-n, y pintados con tinta sumi o bien con pinturas al -leo. There are more images at the bottom of this Web page. The February meeting was graced with the images and story-telling of Norbert Wu, FN-97. His presentation was titled Around the World Under the Sea. Norb treated us to a collection of underwater images from his dives in some of the most remote spots on the Earth, in particular, Antarctica. He noted that in many of his photos he had, in the background, the "safety hole" which is the way to get the air you need when your tanks are empty. It is no surprise that a photographer will shot what is interesting to him and that the safety hole is always in his line of sight. A side benefit of looking up towards the light is the backlighting on the jellyfish. These creatures presented grand subjects for Norb's images. Then there was the discussion of the Leopard Seals. These are some of the more frightening creatures on the planet. Norb told of some folks who had thought that perhaps the seals just focus their attention on penguins so they tossed a dead penguin in the water to see what would happen and the seals spent their time focusing on the juicy-looking humans doing the tossing. Norb just doesn't get in the same water at the same time with these critters. Before the talk, I was chatting with Cagan Sekercioglu, a candidate for Student Member status. He heard stories of Norb's discovery under the ice of fish's egg clusters. They did some studies and found that the eggs, like the fish themselves, contain glycol peptides that act as "antifreeze" for the developing lifeform. You may recognize ethylene glycol by the name Prestone®. Well, the slideshow began and sure enough, there among Norb's amazing underwater close-up shots was one of the fish-egg cluster. Researchers were also able to get video footage shot by seals themselves by attaching a camera to the animal. To get the camera back, they simply took the animal well away from the ice edge and turned it loose in a hole they punched in the ice. That way, the seal was sure to come back to the same spot as it was the only source of air. Oh, not to worry, they returned the seal to the ice edge and the camera-mount glue came off with the next molt. So, what did the seal film? These cagey hunters flush prey out of nooks and crannies by blowing bubbles at them and grabbing them as they try to dash off. Well, the attendees at the Chapter meeting didn't dash off by any means. Norb and his wife, Deanna Mah stayed around for questions and comments well after the meeting. We thank them both for the wonderful evening. For the May 21st meeting, Rusty and Dan (MN-66) Liebowitz have offered to not only host a pre-dinner cocktail party, Dan has also offered to speak about his most recent, and yet unpublished, research: Emin Pasha - Rescue on the Equator. Emin Pasha, (ne Eduard Schnitzer) German explorer and physician, served (1876 - 1878) under General Charles Gordon in the Egyptian Sudan, and in 1878, he succeeded Gen. Gordon as governor of the province of Equatoria. During the 1885 Mahdist uprising, Emin Pasha was cut off from the outside world. Sir Henry Stanley organized a relief effort and met Emin Pasha on the Albert Nyanza in 1888. Emin Pasha's position was not as desperate as Stanley had originally thought, but in 1889, Emin Pasha agreed to accompany Stanley from the Sudan to Mombasa. He was murdered in 1892 while exploring the area of Lake Tanganyika. Dr. Liebowitz's most recent book, The Physician and the Slave Trade: John Kirk, the Livingstone Expeditions and The Crusade against Slavery in East Africa, was published in December 1998. June Outing, but ACT NOW! We have a special opportunity to tour an exact replica of Captain Cook's ship, the H.M Bark Endeavour while she is docked in San Francisco. Our cocktail party and tour will be after the ship has been closed to the public and will be limited to only 70 people. This will be a special evening for everyone who attends, as well as a fund raising opportunity. We cannot charter the ship unless we have a strong interest shown by April 5th. Please reserve your spots today. Please reserve spaces for the Cocktail Party of Tour abroad Cook's ship The Endeavour, June 19, 1999 7:30 to 9:30 p.m..
$90/person... $100 if postmarked after April 1st. **. There will be no tickets sold at the gangway. ** No checks will be deposited until April 15th. If we do not have sufficient interest by early April to charter the ship for June 19th, all checks will be returned, uncashed by May 1st. This is an exact replica of Cook's ship and it has not been modified or changed to accommodate persons with limited mobility. The deck is 300-year old fir, so the ship's crew will ask you to leave all stiletto- heeled shoes at the gangplank. The tour goes through some areas with low clearance (less that 5') and the cocktail party will be on an open deck -- comfortable, warm attire is recommended. Mrs. Hansen's 2nd Graders are learning and growing in a new room at school this year. Formerly known as Room 8C, we are now the Johnny Appleseed Room! Our principal, Marta Kyte, assigned each classroom the task of coming up with an "explorer name" for their room, since we are a brand new school and are known as the Dennis G. Earl Explorers. Thinking long and hard, we realized that not only were WE going to live in this room for the 1998-1999 school year, but the name we chose for the room would be there for ALL of the 2nd graders who will follow us. Since we LOVE to read, we decided to brainstorm names of different characters from some of our favorite books. We are all big fans of TALL TALES and decided to research to see if any of these characters in these TALL TALES were "real" people. Much to our surprise and delight, we found that Johnny Appleseed was a real person!! We found out that John Chapman (Johnny's real name) was an "explorer" in the real sense of the word--exploring new territories. Besides exploring new areas, he also added to these areas by planting apple trees for everyone to enjoy. We did a comparison of Johnny Appleseed to ourselves and saw a lot of similarities. We, as 2nd grade students, are as diverse as the different apple trees that John Chapman planted as we go into new territories of learning. We are adding knowledge not only to ourselves, but also helping others around us by what we learn. We realized that being the Johnny Appleseed room would be a great way to promote the idea of planting the "seeds of learning" in the classroom and watching these seeds grow into beautiful, super Dennis Earl Explorers. Stop by and see us sometime. We'd love to plant some seeds of knowledge in you and watch YOU grow, too! Congratulations to Joel Tuttle, MN-99 who was recently accepted as a Member of The Explorers Club. Dear Les: We did it! Bill and I reached the summit of Mt. Aspiring on February 24 at 1:00 PM in good weather. It was a 15-hour round trip from the hut, most of it on rock and very hard work, but so very worth it. The mountain was mostly rock this year due to an exceptionally warm summer so we could not do the regular route on the glacier and had to traverse the entire NW ridge which was spectacular and very exposed. The 4,100-foot climb ended with 400 feet of 30- to 40-degree ice to the summit. We flew out this morning via helicopter and will be home March 4. Tomorrow we drive up to Mt. Cook to hike and see our climbing friend Brede. She was wonderfully helpful in making some of the arrangements for the Aspiring climb. Then if we have time, we will drive to Dunedin and play tourist before flying home on March 4. Tell our friends at the Explorers Club that wish them all the best. -Dana and Bill P.S. Les--when are you going back to Vinson? December?? From: Robert Schmieder, FN-86 Subject: Manteno Update 3/4/99 Today at 2000UTC the raft was located at 06:35N and 84:41W. John reports that they are drifting on a course of 145 degrees true at a speed on about 1 knot. Over the past two weeks the raft has been caught up in the GYRE (large whirlpool) in the ocean about 160 miles south west of the Costa Rican coast. During that time, John reported the raft has been constantly battered by bad storms, ship worms have attacked some of the balsa logs, and the manila rope bindings holding the raft together have begun to decay and part. Consequently, the raft has lost most of it's ability to act like a sailing vessel and has therefore become nothing more than a floating platform. Our position plots over the past two weeks indicate the raft has been going in circles under the influence of the GYRE. At the start of this week John made the statement that the raft could remain afloat perhaps for only one more week, thus the decision was made to attempt a commercial tow to a port on the coast of Costa Rica. After many failed attempts to secure an affordable solution it was decided today to accept a generous offer by the Costa Rica Coast Guard to come to their rescue. As of the end of our conversation, the CG is dispatching a 65' cutter to the location of the raft, estimating 12 to 15 hours for them to arrive. John and the crew will abandon the raft, along with all their vital supplies and gear. The Coast Guard has agreed to tow a few of the vital components of the raft such as sails, hardwood masts, hardwood cross beams (5 of them), and perhaps 3 of the center balsa beams of the raft. The remainder of the raft will be scuttled at sea. Special thanks go to Captain Claudio Pacheco and Lt. Commander Bodilla of the Costa Rican Coast Guard as they have been most cooperative and willing to help. Guys, if you are reading this update, a sincere "Thank You" to both of you. It is fully John's intent to establish a base site in Costa Rica where facilities and supplies will support effort to rebuild a replacement raft. Once completed, that raft will continue the expedition to Hawaii as originally planned. We will attempt to update this page as decisions and progress are made. During today's radio contact we had several school stations on frequency in hopes of having a conversation with the raft. It was unfortunate that the raft logistics occupied most of the time. John did however, recognize those stations and sincerely apologized for not having time for them. John had to hurriedly sign off and begin preparations for the arrival of the Coast Guard vessel. After John left the frequency and while Annie remained on the phone patch connection, we were able to establish contact with KB9KLJ, Dan at the Hubert H. Humphry Middle School in Bollingbrook, Ill. Unfortunately, by the time we were able to talk, Dan indicated the last bell had rung and most, if not all of his students had gone. Nonetheless, Dan was quite interested to gather as much information from Annie as he could, and commented that his students would be most pleased to receive all the news. We also spoke with K1YJK who is the custodian for W0GCD at the Graland Country Day School in Denver. Bob was at his home at the time but was delighted to have listened to the whole radio contact and was eager to share it with his students as soon as possible. Bob was most interested to express his appreciation for the expedition and the value it contributed to the students in his school who have been closely following. We plan no further radio contacts with the raft as it is necessary now for the crew to begin the task of organizing for the journey to shore; radio antennas will be first items to get out of the way. John will have marine band VHF contact with the cutter as it nears. Once John reaches shore he will be in touch with Annie to determine the next steps. Stay tuned. Please reserve spaces for the Merle Robertson talk, at the St. Francis Yacht Club on Friday, March 26, 1999. $40/person... $45 if postmarked after March 20; $50 at the door. Cocktails, 6:30 PM, Dinner, 7:30 PM, Speaker, 8:30 PM.